This isn’t intended to be a gripe session. We know we have made our bed and we are happy to lie in it. This is, as much of this blog is, simply a sharing of our experience in case it is beneficial to others. We go through much of parenting as a completely new experience and I feel where that experience can help others it is worth sharing. February was an exceptional month of our Travel Team Parent schedule. We are used to traveling throughout the state for soccer and volleyball. It is nothing to drive 2 hours to attend a tournament or even for a single game (although 4 hours on the road for a single soccer game begins to stretch the limits of logical value). 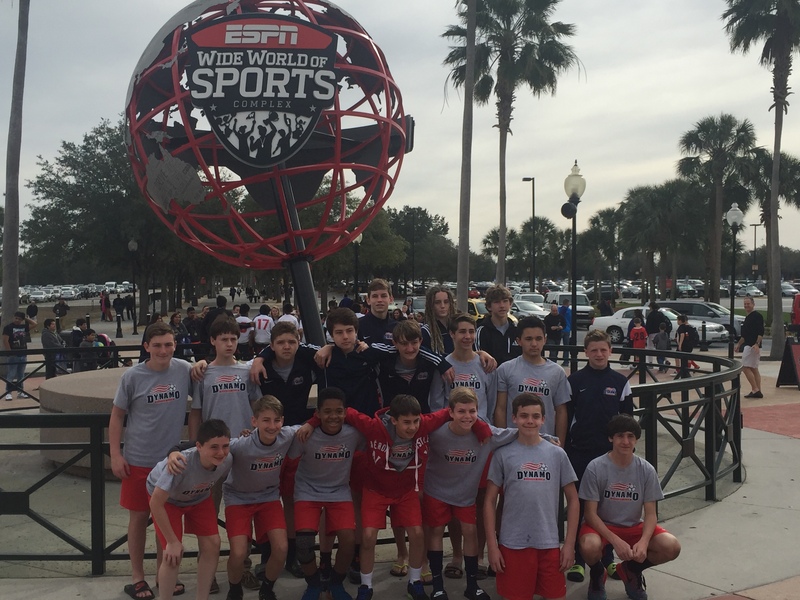 But in February our travels extended to Florida and Pennsylvania for multi-day tournaments that were quite a big deal to the boys’ teams. 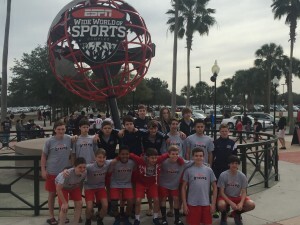 Our travels started with a soccer tournament at the Disney ESPN Wide World of Sports complex in Orlando. Our youngest son’s soccer club takes the U14 Boys and Girls down to this tournament every year. There are a wide variety of teams from around the country (and some international) throughout various age groups. With a world class facility and the Disney touch, this was quite an event. Having done this for several years, the club had a well organized plan for this event. Training sessions started in January with as many outdoor sessions as the weather would allow. Conditioning and technical instruction were a big part of the prep. Most of the boys were involved in playing indoor during this time as well so soccer consumed five or more days a week through January and up until the trip. Along with the planning there were rules. This was supposed to be a trip for the boys, a trip where they could bond and benefit from some autonomy. Parents were not allowed to stay in the same hotel as the team. While we looked at flights to Orlando, the flight the boys were taking was the best (direct and cheapest) so we booked tickets for the same flight. We were told by our youngest that we were breaking the rules. While we confirmed we were not, we told him that we would make an effort not to talk to him. The players’ independence (and our unnecessary presence) became evident when we arrived in Orlando as the director of coaching told us “Okay parents, we got them. You can go on.” Point taken. Once in Orlando, we saw the boys for games but otherwise they did their own thing. They had a practice when they arrived, had time to strategize in the evening and the next morning we saw them at the fields. Luckily the chaperones kept us all informed with pictures posted on Facebook and it was easy to see they were well taken care of. And more than once we heard several of them state they were being treated really well – it was a professional and organized trip. Going down to the tournament we didn’t know what to expect. We had little info on the teams they were going to face and the general sentiment was “I just hope they don’t get blown out”. To our pleasant surprise, the boys won their first two games and secured a spot in the playoffs. Somehow traveling to Florida for 4 games seemed a lot more cost effective than just 3. The boys played hard but faced teams in the final two games that were overpowering. There were no regrets, they put it all out on the field and after the initial disappointment, I don’t recall too many frowning faces. It was an intense few days with ice baths in between games and meals where the team completely cleaned off the table. They were able to spend half a day at Universal Studios and hit the pool a couple of times (which is a nice option for February). They even got to bring home some hardware as they were awarded medals and a trophy for making the semi-finals. Overall, a great trip and remarkable experience for them (plus with all the extra practice, conditioning and games against some really good team, they should be well prepared for this Spring season). For our oldest, one of the exciting elements of making the Zonal team was an extra tournament in Harrisburg PA (and the option to gain a National Tourney bid). The volleyball club maintains three teams at his age – a National team that travels regularly, the Zonal team he is on that has the one out of town tournament and a Regional team that plays in regional tournaments, most of which are at home or at least in state. His tourney in PA was two weeks after our Florida trip and we had to adjust our thinking a bit after the hands off approach of the soccer trip. With the volleyball trip we were responsible for getting him up to Harrisburg and getting him to the tournament venue from the hotel. One of his teammates rode up with us and it was interesting to hear their chatter, mainly about the team, practices and expectations for the weekend. We drove up Friday night and didn’t get into town until around 9. He and his teammate went in to join the team meeting (already in progress) and then get their room assignments (even though we were responsible for transportation, the boys roomed together so the team could bond). Saturday morning they had 3 matches so we got started early (the boys were so anxious they kept moving our departure time up) and took our son and a couple of teammates over to the venue. Out of 16 teams in their division (one open division for all the teams in their age group), many were national teams and their team, as a Zonal team, was ranked pretty low (ie 16th). The first couple matches were against teams with a decent size advantage over us and at times it showed. Our guys played well (especially in the first match) but struggled to compete against teams with one or two hitters a good foot taller than our tallest blocker. For their third match they took it to the third game (third games were shortened to 15 points) but unfortunately lost (partly due to a bad call when the score was tied 13-13). They were a little frustrated from that loss. For the afternoon they had a few hours off so we took a mini-van load back to the hotel to rest. In the evening they played two more matches – both of which they would have won had they played as well as they had in the morning – both of which they lost. They just seemed tired and at times not very focused. Their coach tried to bring them around but their spurts of greatness were a little too far between. The next morning, being the bottom seed, they took on the top team in the silver division (the gold bracket was the top 8 teams, the silver the bottom 8). Again, they played very well but were outgunned by a taller team that was able to capitalize on their height and power. With a loss in the playoffs, they were done and after they covered their responsibilities of working a game in the gold bracket, we headed for home. On the way home we had a couple of teammates with us. The chatter was lively and they boys seemed to have fun. We probably heard more about the pranks and horse play that went on at the hotel then we should have but at least no one was thrown out or injured. They kept up the conversation for the first couple of hours then eventually they started dozing off. It had been a long weekend and they were exhausted. In both of these travel tournament experiences probably the biggest benefit each boy gained was the social aspect of being with their team. The teams seemed to really bond and this will help them as a team through the rest of this season (and in most cases the seasons to come where they are playing together) and as individuals. They interacted with various members of their team, not just their sub group of a couple friends, and learned to have fun as a group. The experiences will last a lifetime and they are made more memorable by the people and characters (and pranks and jokes) that are all part of the event. While the time and financial costs of the trips is nothing to overlook, the value of the experience is priceless. I am grateful that they had the opportunity to participate in these travel adventures and happy that we got to enjoy it with them.